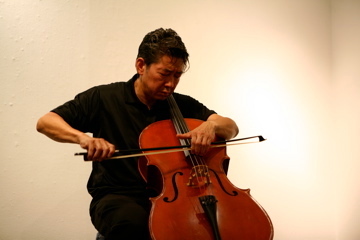 Irumagawa started performing improvisational music on the cello at Gallery Surge in Kanda in 1989. Thereafter he frequently performed in collaboration with contemporary art projects and experimental theater. In '98 he launched the solo series "Improvisations on the Cello or Non-Border-Transgressive Solo" at Proto Theater in Takadanobaba, which continues to this day at Nanahari in Hatchobori. He also released a CD and a CD-R with the same title. In 2004, Irumagawa performed in New York with the theatre project Lens, and earned high praise for his solo performances as well as for the theater productions. Since then he has been collaborating frequently with musicians from Japan and other countries, and exploring new frontiers in various projects including a trio with Shuichi Chino and Masaki Sasaki, and a trio with Kenichi Takeda and Jun Harada. He has recently been performing more frequently in Okinawa.